﻿ NVENC Encoder in Handbrake? How to Use NVENC Encoding? Does Handbrake Ever Get NVENC Support? How to Use NVENC Encoder? Handbrake, initially released on 24 August 2003 (14 years ago), has been regarded as the founder of video processing program. And a conservative estimation of its users (from Windows/macOS/Linux) reaches billions, among which about 42% users speak highly of Handbrake performance in 4K video transcoding, 15% users gradually switch to HB alternatives and the rest still consider Handbrake as their first choice if handbrake can decode and encode video to H264/H265 at much faster speed. To response users' needs and improve users' experience, Handbrake developer team overcomes every potential difficulty and eventually successfully makes Handbrake support Intel QSV hardware acceleration to speed up video (esp. 4K UHD video) processing to a certain extent. It works, but that's not fast enough, especially when it comes to transcode 4K video in HEVC codec. Therefore, majority of Handbrake users once again feel curious about Handbrake GPU hardware acceleration and wonder if handbrake supports Nvidia NVENC GPU hardware encoding tech. Well, the truth is that the current Handbrake doesn't feature Nvidia GPU hardware acceleration tech. Yet, there is still high likelihood that Handbrake might absorb Nvidia NVENC in the near future to further accelerate Ultra HD video processing speed. In the current situation, you'd better resort to Handbrake alternative with NVENC GPU hardware encoding tech supported to convert video (H264/H265) at faster speed if speed is the one you care about most. Wanna Use Nvidia NVENC to Encode Video Quickly? It supports GPU hardware acceleration (Nvidia NVENC/Intel QSV/AMD) to hardware encode (4K/HD) video to H264, HEVC (hvc1/hev1), MP4, etc at 250-320FPS with 98% quality reserved (High Quality Engine). Which Is the Best Video Encoder with Nvidia NVENC Hardware Acceleration? In the current market, there are dozens of video converter programs that support hardware acceleration techs. Among them, Wondershare Video Converter, Any Video Converter, Movavi Video Converter and MacX Video Converter Pro are the strong performers. 1. Wondershare applies Intel QSV CPU encoding, Nvidia CUDA and AMD APP GPU encoding techs to its video converter tool, which can dramatically improve conversion speed up to 2-3X faster than before. Yet, you may have already found that wondershare doesn't support Nvidia NVENC hardware encoding. 2. Any Video Converter, a highly sought-after H264 hardware encoder, relies on Nvidia CUDA hardware encoding tech to make H264/HEVC conversion faster. So you can't activate your NVENC power via this 4K video processing program. 3. Movavi Video Converter supports both Intel QSV and Nvidia CUDA for faster video processing, just Nvidia NVENC excluded. 4. 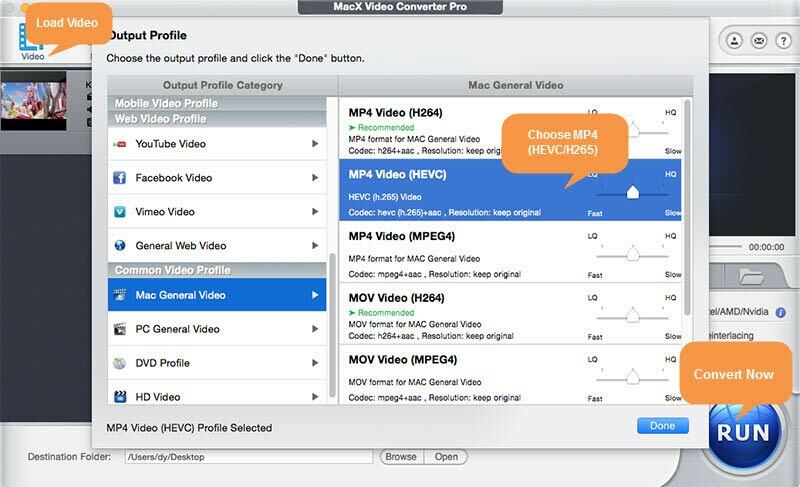 MacX Video Converter Pro unremittingly improves its speedup techs, from the earlier Intel QSV CPU hardware acceleration to the latest Nvidia NVENC/CUDA and AMD APP. It constantly optimizes itself to satisfy users' need in high definition and 4K Ultra HD video processing speed. So building on the above introduction, it's clear to see that only MacX Video Converter Pro is the truly Nvidia NVENC hardware encoder among the current high-end video converters group. It allows you to compress, edit and convert video, esp. large-sized 4K Ultra HD to H264, HEVC, MP4, MKV, AVI, MOV, etc. 180+ video formats and 14+ formats, plus 410+ preset profiles (Apple, Android, Microsoft, Google) at 5-8X faster speed, up to 250-320FPS. How to Use the NVENC Accelerated Encoder for Video Processing? Step 1: Free download and run this GPU accelerated video converter. If your computer supports Nvidia NVENC, the "Hardware Encoder" option will be automatically ticked at the lower right side of the main interface. Note: to judge if your computer supports GPU Nvidia NVENC hardware acceleration, please check your computer configurations first. 1. To hardware encode video to H264, the entry level requirement is Nvidia graphics card of Kepler generation or later with at least Quadro K420 and GK107 chip. 2. To hardware transcode video to HEVC (H265), higher configurations are the must-have conditions: Maxwell (2nd Gen) or higher graphics card, along with Quadro M4000 and GM204. What's plus, install at least two NVENC chips. Step 2: Hit "Video" button to load your video files. An easier way is to directly drag-and-drop files into this hardware accelerated video converter. Step 3: Choose the output video format as MP4 (H264) or MP4 (H265) based on your own needs from the pop-up window. Tip: on top of NVENC GPU hardware transcoding, this hardware encoder can also activate more HW techs to cooperate with NVENC to simultaneously boost video conversion speed, including Intel QSV (if your PC supports), Multi-core CPU (up to 8), hyper-threading tech and Auto Copy mode (10X faster). You can go to "Options" settings to choose how many CPU cores used in video conversion. Usually the default setting is to mobilize all the CPU cores. And the Auto Copy mode can be automatically detected and selected if both your input and output video codec are the same, e.g, convert MKV (H264) to MP4 (H264). Step 4: Tap "RUN" button and it begins hardware decoding and encoding SD/HD/4K UHD video at GPU hardware accelerated speed. Don't worry about the output quality. It's lossy but only 2% quality loss during the processing thanks to the advanced High Quality Engine to protect the necessary file data from being lost. You have already known the detailed operating steps, but you may still have no idea how fast it is on earth compared with NVENC unsupported Handbrake. Easy peasy! Compare MacX with Handbrake and let the test data speak for themselves. Graphics: Maxwell (2nd Gen) with Quadro M5000 and GM204; 2 NVENC chips. From the actual speed test, you can clearly know the gap of 4K video processing speed between MacX and Handbrake. Basically, MacX runs about 5X faster than Handbrake in 4K ultra HD video processing procedure, not just because of the Nvidia NVENC, but also Intel QSV CPU hardware acceleration assistance. Comparatively, Handbrake for Mac doesn't have any outside help, even Intel QSV unavailable on Mac version. Yet, what you need to pay attention is that Handbrake does a great job in 4K video to HEVC video compression, from 148MB reduced to only 11.5MB with excellent quality. So in short, every coin has two sides. There is no absolute advantage or disadvantage. Just pick out the one you need most at this moment. MacX Video Converter Pro, an all-around 4K GPU hardware accelerated editor/compressor/converter, can convert 4K Ultra HD video to H264, H265, MP4, MOV and compress 4K to 1080p at 5-8X faster speed thanks to the powerful Intel/AMD/Nvidia hw acceleration techs. Handbrake Intel QSV for Mac? When to Feature? Which One to Choose: GPU or CPU Encoding? Click to know the full explaination of Intel Quick Sync Video. Wanna convert video faster? Use Nvidia HW acceleration techs. Download No.1 fast CUDA converter for 4K processing. All-in-1 4K video compressor lets you largely compress 4K video.